How can I buy a content in Officehelp? Buying at OfficeHelp.Biz is safe. Check why. Delivery is immediate. Products can be downloaded immediately after payment. Select the product you are interested. ALL paid products have free DEMOS. Click the BUY NOW button to process the payment using PayPal, the web biggest payment processor and part of eBay. A PayPal account is NOT NECESSARY, credit cards may be used directly. Payments can be made from VISA, AMEX or MASTERCARD cards, or funds already stored on an PayPal account if one is used. 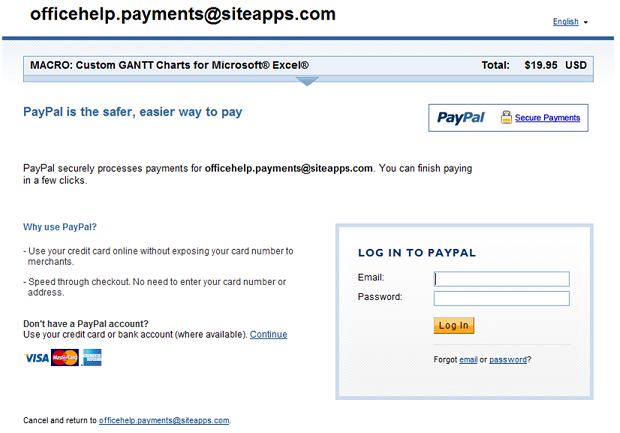 A payment page is generated on a NEW WINDOW, from the secure PayPal servers. Payments MAY BE CANCELLED anytime on the process, until the final PAY button is pressed. If payment is cancelled, you will be shown a PayPal cancellation page with a link to process to the OfficeHelp.Biz cancellation page, where you can leave us a message if appropriate. Once payment is ACCEPTED, PayPal will display a CONFIRMATION page. You will then be redirected to a download page on the OfficeHelp.Biz website. 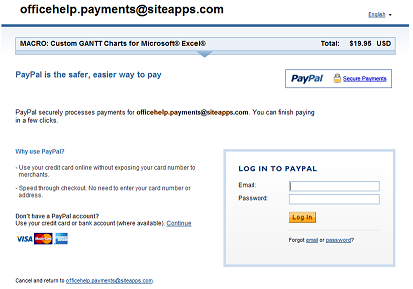 PayPal will send an email receipt of your payment to your registered email.